Licensing is the process of loaning a legally protected (trademarked or copyrighted) intellectual property – a name, likeness, logo, trademark, graphic design, slogan, signature, flavor, or character – to a third-party that will use such intellectual property in conjunction with a new product or service, for a specific time period, geographic location, and distribution channel. Intellectual property owners (Licensors) may be brands, celebrities, artists, publishers, trademark holders, or large consumer goods manufacturers. Companies borrowing the intellectual property – or, licensing in the brand – are Licensees. Licensees pay a royalty – a percentage of sales – on each product sold, back to the Licensor, in exchange for use of the brand. Royalty payments are usually remitted by the Licensee, periodically, throughout the calendar year. Most Licensors seek to strengthen their brands or trademarks, drive consumers back to their core products and services, and create a new revenue stream. Strategic licensing helps achieve those objectives. NOT ALL LICENSORS PRIORITIZE THE RIGHT GOALS. 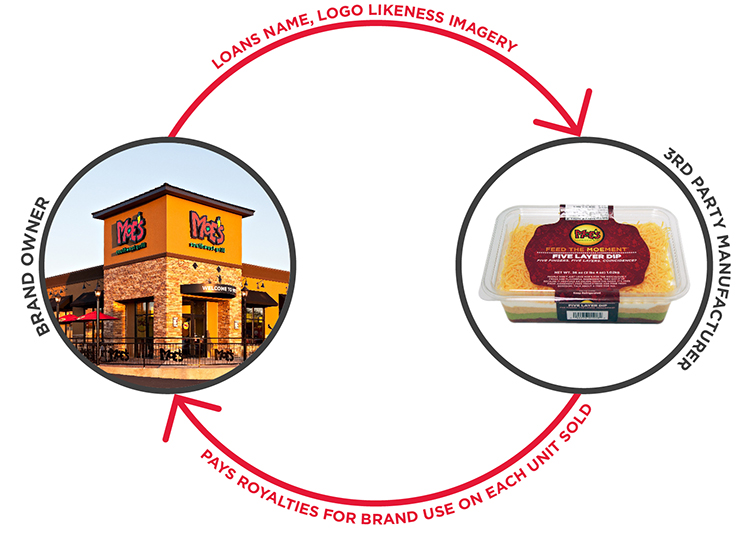 Some licensors chase royalties as a primary or singular success driver, and will extend their equities to any product category or company willing to write a check. This practice falls into the definition of licensing – but not strategic licensing. Strategic licensing involves the evaluation of new categories that will augment brand equity for the long-term, and offer current brand enthusiasts new ways to enjoy the brand. Brand owners who follow those goals first will normally see a more robust new revenue stream over the long-haul. That is how a strategic licensing agency should look at your business. HOW FAR REACHING IS THIS PRACTICE? Over $167 billion in licensed merchandise was sold throughout the world in 2016. Volume is at an industry high. The practice extends across geographic regions, intellectual property types, and product categories. Many shoppers assume the majority of licensed goods are inspired by entertainment and the hot characters. And that’s not really true. Less than 20% of dollar sales on global licensed merchandise is based on entertainment content. In North America, it’s less than 12%. Licensed merchandise is also inspired by intellectual property types like non-profit organizations, fashion labels, corporate trademark brands, restaurant chains, famous artists, iconic celebrities, best-selling books, consumer packaged goods, automobile nameplates, mobile apps and many others. 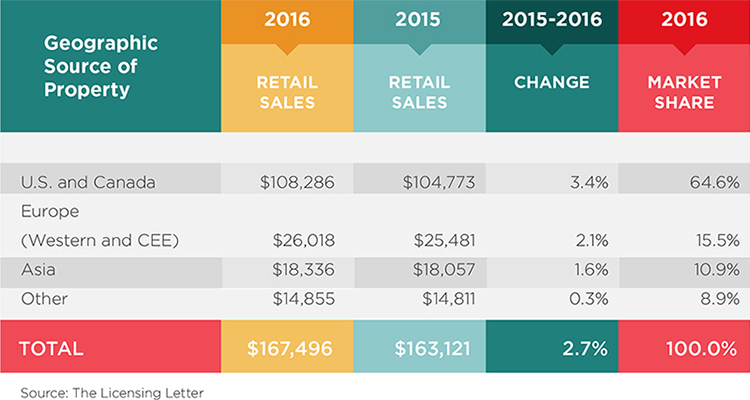 A generation ago, retailers were diverse and plentiful – in fact, until 1994, no U.S. retailer represented more than 10% of consumer spending. Manufacturers across categories were voluminous as well, manufacturing in the U.S. and abroad. Consequently, most brand owners or licensors – who could show the possibility of growing in a different category – could find a willing manufacturing partner, space on shelf, and a way to put merchandise in front of the consumer. Today the number of brands seeking expansion through strategic licensing has multiplied – while manufacturers are consolidating and contracting. Meanwhile retailers have decreased in number so dramatically that in many categories, less than ten merchants can determine the fate of a product line. The remaining manufacturers and retailers are increasingly competitive. They are funneling a limitless set of brand options, but they are taking take fewer chances. Consequently, licensors must be much more sophisticated as they craft a campaign, and convince manufacturers and retailers that their intellectual property will help grow a category and generate higher performance than current product already on shelf. Buyers will not fix what isn’t broke. HOW DOES A LICENSOR CONVINCE THE MARKETPLACE of its viability in new categories? Licensing is not for all brands. Some brands at early stages do not yet have enough in-market history to warrant substantive licensee and retail investment. Some brands are owned by entities uncomfortable with delegating responsibility to 3rd party entities. Experienced licensing professionals and agencies can help map out upside potential and how to mitigate risks. But, brand owners must enter this practice with the same enthusiasm and passion that they attribute to advertising development, PR placement, retail promotion, and other critical areas of marketing investment. Without that passion across decision-makers, strategic licensing may be a source of aggravation, rather than the source of new growth as intended.